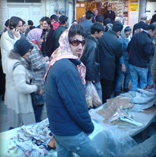 A male street trader selling headscarfs. "There's only one stop that bus is making", my friend laughed as we negotiated the crowds of Tehran's estrogen interchange that is Vanak Square. My reaction to this would only have been found on the inside as the ugly reality of what I'd seen 24-hours before revealed itself. The previous day I'd stumbled upon this Islamic carnival quite unknowingly, in passing I donned a dumb grin, "Oooo, TV cameras, Oooo big bus, Oooo, lots of officially dressed people". I slowed down, deducing what type of guest was in town: there was just enough people for it to be the president, too many for a foreign notary and certainly too many for a news article. The bus was curtained, so I guessed that they were famous, but why so many empty cars parked around I pondered. I loitered, but it was too calm, I assumed I'd missed the precession and left in disappointment. That night I'd popped out with my father, traveling by car we couldn't help but go through Tehran's notorious Jordan Boulevard – notorious among other things for being a road not unlike a catwalk. As we inched forward I noticed the traffic had slowed for different reasons to usual. One-by-one police officers glared in at the drivers subsequently ushering the women drivers to the side whereby further police and a blacked-out van awaited. If a headscarf falls in a far away forest and nobody is there to see it, will they make a sound? If a headscarf falls in a far away forest and nobody is there to see it, will they make a sound? I thought while I sat watching the the police decipher the morally correct with no great ease. "My friend was cautioned", said one girl at work the next day, "yes mine too", said another. We all shared our stories and although this annual tactic is expected we all agreed that the level was way beyond what has been seen for the last few years at least. A fellow blogger amusingly writes, '“The news is reporting that 93% of the population approves of the crackdown on hejab,” our cab driver told us. “If that is true, there is no need to enforce hejab,” I responded.'. This self-serving statistic, true or not, is mentioned almost like things would be different if it was the other way round, but we live in the Islamic Republic and it's that time of year for us to be reminded. 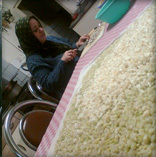 My auntie/zanamoo/father's brother's wife - knowing her role. "Pull your headscarf up", a friend finally points out to the lady on my right at the restaurant table. Relief washed over me, yet not due to the halting of impure thoughts that were obviously tunneling through my morality. I can liken the awkwardness in this dress-deviation to maybe that of seeing a dollop of mayo laughing on the unsuspecting lips of a guest at lunch. "You've got mayo on your lips, mayo-is-on-your-lips, there's mayo still on your lips and you haven't noticed but we all have". It should be added that as yet, mayo on the lips – regardless of whether you like the taste of it – is not punishable by death, even though my imagination runs wild at how I might help clean it off. "I just can't do it", I remarked to our good samaritan, "Normally I can't either", he responds, "which is why I said it in a joking way", he adds while humorously reenacting the initial advice. "Any attempt to indirectly point out this deviation is still not comfortable", I continue, "'oh look, a respectable policeman' or 'are your ears cold? ', it still equates to the same thing for me", I add in frustration. "Similarly, I will never buy a headscarf as a gift, it's like buying one's mother frying pan as a gift", I conclude. "Actually, the man must rule the woman, in fact he has to!" My difference in facial expression between headscarf-on and headscarf-off is maybe the same as before my uncle recently enlightened me of a woman's role in life and after – yet maybe my rigid stare in response was giving the man more respect than was deserved. "Actually, the man must rule the woman, in fact he has to! ", I was helpfully informed. And in a way I help him do this – beginning with my aunt – simply by using her title to me, "Zanamoo", which translates as 'my father's brother's wife' (with Farsi different titles apply to paternal and maternal sisters and brothers and their respective in-laws). Even the language is helpfully structured to remind her of her position in the hierarchy. Like with the mayo, it can be seen on my lips – they are silent in response but nevertheless heard.